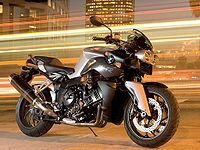 BMW was known for its conservative but innovative approach towards motorcycles before 2006. Release of K 1200 R marks a new era and a new image for BMW. BMW has also jumped into the technological race between motorcycles manufacturers as this model is one of the most powerful “Naked” production motorcycle in the world producing 163 H.P. @ 10250 Rpm with a huge torque of 94 Lb.Ft. @ 8250 Rpm and a mind numbing explosive acceleration of 100 km/h from stand still in 2 seconds with a top speed over 163 mph 260 km/h (Stats that were previously only associated to Japanese motorcycles). There are many other radical features in this bike, from its unique styling, front and rear suspension, fully sequential cylinder-specific fuel injection with integrated anti-knock control and a three-way catalytic converter in the exhaust and anti lock break system. Peak torque is available from 3500 rpm all the way to the 11,000-rpm redline. That means wheelies are just a touch of a throttle away! This page was last edited on 23 November 2010, at 22:43.